This is the story, mostly in pictures, of a journey on foot from Salzburg to Seville via Santiago de Compostela. The walked distance is approximately 3200Km or 2000 miles. + 250km via cable car, train and bus. 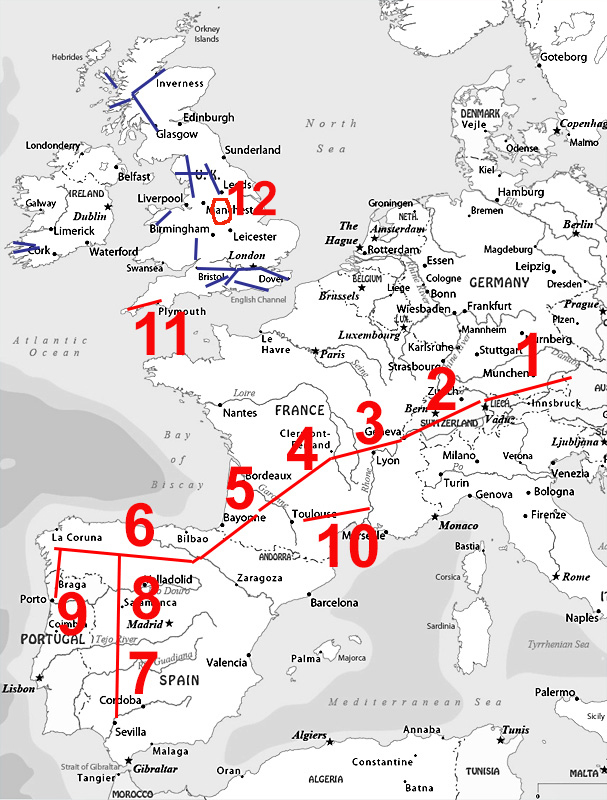 The order below is showing all roads leading to Santiago de Compostela, not the order the journeys were undertaken. My written approach has changed over the years, so has the quality of digital photography. Now I favour few words and big pictures, in the beginning it was the other way round. Walks 9, 10 & 11 were after the main journey and not counted in the 2000 miles. The blue lines indicate other long distance walks undertaken but not shown on this site. Warning and disclaimer to anyone who reads this diary....It is not, nor was planned to be a great work of literature. The written information is based on the extracts of my daily diary and can best be described as the 'aimless thoughts of the village idiot' >>> If you have a problem with this, just look at the pictures.